During your first biology course every student learns about ‘the codon’ that is the key to unlocking the information encoded by DNA. Discovery of this basic biological concept, called the ‘genetic code’, is often one that intrigues students and initially peaks their interest in biology. Unfortunately, many students do not consider how this early excitement and interest for biology could be translated to a career. Outside of pursing medical or dental degrees, the option of pursuing a career as a research scientist is often entirely ignored and uninvestigated. Typically thought to be something pursued only by Albert Einstein-ish individuals with off-the-chart IQs. It is the goal of Beyond the Codon to dispel this myth and encourage elementary/middle-school, high-school and undergraduate students to consider this as a viable, and well-worth it, career to pursue! Moreover, during our workshop sessions we share insight into the different types of research careers from academia and government, to industry/biotech. Beyond a good grasp of basic scientific concepts there are several important keys to a successful career in research. In this regard, our goal is to provide informative workshops covering steps that can be taken during high-school, undergraduate, and graduate school to best prepare for this exciting career. 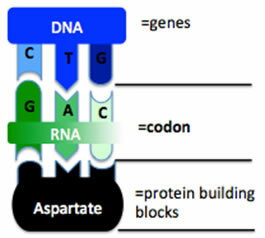 These are the keys Beyond the Codon! We also share exciting recent advances in the field of cancer research and explain the basics of how approaches like cancer immunotherapy work. Elementary and middle school students benefit from hearing about careers in biomedical research, what it’s like to do research in the lab, and the basics about the biology of cancer. Click here to book a session for your students today! Mission Statement – Our mission at Beyond the Codon is to provide students and beginning investigators with knowledge on how to navigate a career in biomedical research successfully, while increasing student exposure to accomplished women and minority scientists. Our secondary goal is to encourage elementary/middle, high-school and undergraduate students to consider a career in science by exposing students to information and insight about the rewarding career of biological research early. Founder – Charlie Garnett-Benson, Ph.D.